On my way to work this morning, I was thinking. This is a dangerous past time I have from time to time. I was thinking about what the most "summerish" thing I have done so far this summer. This is what I came up with. Awhile back I weeded the flower bed and painted one of our wooden fences. That's all I got. I have not once stepped into a swimsuit. I have not once laid out in my backyard. I have not once gone to St. George. And I have not once had a picnic in the park with my hubby and little puppy. It occurred to me that it is AUGUST and I need to get in some summer activities before it is freezing cold and snowing all over again! I would love to serve this delicious salad at my picnic in the park with my hubby and little puppy. 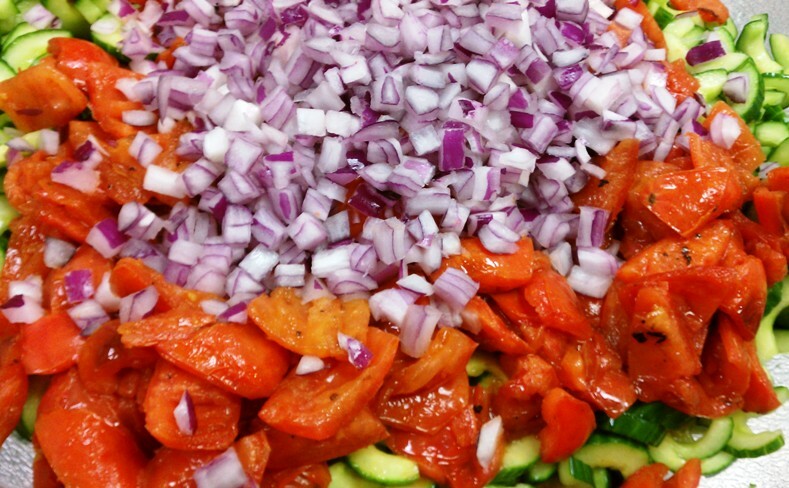 I am not a fan of tomatoes, but these grilled tomatoes in this salad are SO good! And I have learned that I actually like feta cheese. I am not very adventurous when it comes to cheeses, and feta has always reminded me of blue cheese - which is one cheese that will never grow on me. But I had feta cheese at the last cooking class I went to at the Blue Lemon. Chef Todd made a roasted red pepper & feta cheese bruschetta and it was AMAZING! Feta cheese in this salad is equally as delicious! Put the sliced cucumbers in a large bowl, sprinkle them with the salt, then set them aside for 30 minutes. Spread the cucumbers out on a double layer of paper towels, pat them dry, then put them back in the dried bowl. Whisk together the vinegar, olive oil, mustard, and sugar in a small bowl, then pour the dressing over the cucumbers and toss until the slices are evenly coated. Cover the mixture and place it in the refrigerator. Prepare the grill for cooking. As the coals are heating, halve each tomato and scoop out the seeds. 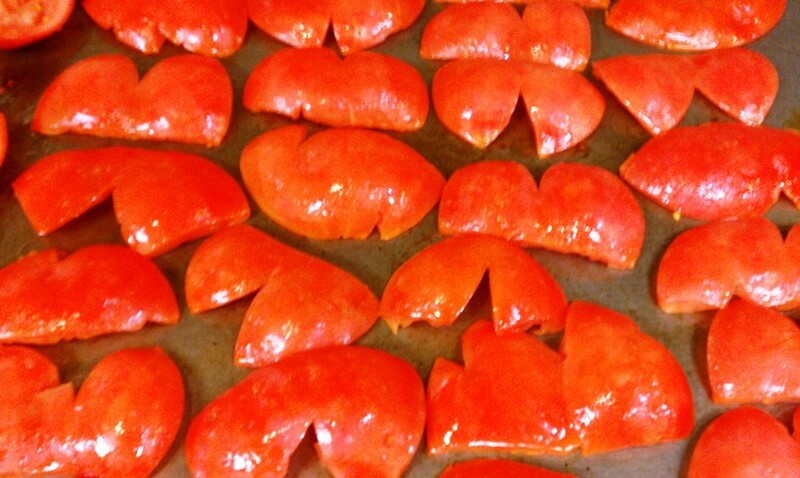 Slice a bit from the rounded end of each tomato half, so that it can sit flat. Brush the tomatoes with olive oil. Over the hottest coals, grill the tomatoes until they're lightly charred, about 60 to 90 seconds per side, turning once. (We did ours on a flat grill, since we do not currently have a charbroiler). Transfer the tomatoes to a plate to cool. Coarsely chop the tomatoes into large chunks, then add them to the cucumbers, along with the onion, parsley, and pepper. Toss the ingredients to blend them evenly. 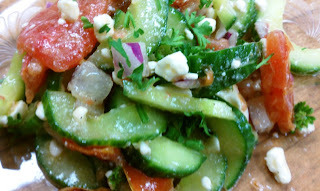 Transfer the salad to a serving dish and top it generously with the feta. Serves 8.